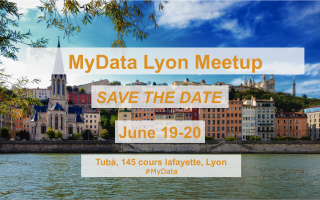 After Torino, Aarhus, Berlin, London, Paris and Brussels, the French Hub (Fing and Tubà) is pleased to invite you to the next MyData Global Meetup in the City of Lyon on the 19th and 20th of june. Moreover, on the 21th you will have the opportunity to attend the MesInfos Open Conference, a full day dedicated to the learnings of the MesInfos Pilot, a 2000 testers experiment of the MyData model. > “A very MyData evening” -19th of June from 3pm till 8pm – Adress : Tubà – 145 cours Lafayette, Lyon. > “MyData Workshops” – 20th of June from 9am till 6pm – Address : Tubà – 145 cours Lafayette, Lyon.